Crème brûlée (French 'burnt cream') is a dessert consisting of a rich custard base topped with a layer of hard caramel, created by burning sugar under a salamander or other intense heat source. It is usually served cold in individual ramekins. The custard base is normally flavored with just vanilla, but it can be flavoured in a number of ways, with chocolate, liqueur, fruit etc. It is first attested in France, in Massialot's cookbook, in 1691. The French name was used in the English translation of this book, but in the early 18th century, it was called 'burnt cream' in English. In Britain, it is associated with Trinity College, Cambridge, where it is called 'caramel cream' and where "the college crest was impressed on top of the cream with a branding iron". It was introduced to Trinity College in 1879, though some cookbooks claim a much older origin. In Catalonia, it is called crema catalana, and has a custard base aromatised with lemon and cinnamon. In cooking, crème caramel or flan is a kind of rich custard dessert with a layer of soft caramel on top. Both names are of French origin. The dish has spread across Europe and the world, and is known as 'flan' in Spanish-speaking countries. In the United States, the dish is now best-known in a Latin American context, so is called flan; in Europe, it is generally known as crème caramel. Crème caramel is a variant of plain custard (crème) where some caramel syrup is poured into the mold before adding the custard base. After the custard has set, it is turned out, leaving a caramel sauce on top. Under the name flan, the dessert is very popular in Spain and in former Spanish colonies in Latin America and the Philippines. Like all custards, flan is made with whole eggs, milk or cream, and sugar. The typical flavoring is simply vanilla, however, there are numerous variations, including almond, pistachio, lemon, and many types fruit. In Argentina, and in some neighboring countries, flan is usually eaten with Dulce de leche. An imitation of flan may be prepared from instant flan powder, which is thickened with agar rather than eggs; "Royal" is a popular brand. In some Latin America countries, the true custard version is known as "milk flan" (leche flan) or even "milk cheese", and the substitute version is known as just "flan". Flan is ubiquitous in Japanese convenience stores under the name "custard pudding". It is not uncommon to find an entire shelf in a Lawson or 7-Eleven dedicated to over a dozen brands and varieties of flan. A cream puff is a dessert made from a filled choux pastry (pâte à choux), a warm dough made with water, butter, flour and eggs. The filling is typically whipped cream or custard. The eggs cause the pastry to puff up into a hollow ball which can be filled by injection or by slicing off the top of the pastry which is later replaced. Cream puffs can be topped with powdered sugar, frosting, fruit, or chocolate. The cream puff originated in Italy, and is said to have been created by Poelini, a chef to Catherine de Medici. It was then brought over to France in the 16th century. It debuted at the Wisconsin State Fair in 1924. In 2005, over 340,000 cream puffs were sold at the fair, taking in a profit of over $1 million. Currently, there is a growing appreciation of cream puffs. Several companies in Japan have popularized the pastry, including Choux Factory and Beard Papa. A profiterole is a cream puff filled with ice cream and typically topped with a chocolate sauce. A tart is a pastry dish, usually sweet, similar to a pie, but different in that the top is open and not covered with pastry. The tarte Tatin is a particular kind of "upside-down" tart, of apples, other fruit, or onions. A Danish pastry (or danish) is a sweet pastry which has become a speciality of Denmark and is popular throughout the industrialized world, although the form these pastries take is significantly different from country to country. In the Scandinavian countries (including Denmark) it is called wienerbrød/wienerbröd (Viennese bread) after the itinerant Viennese bakers who brought their pastry skills to Scandinavia. A danish's ingredients are flour, milk, eggs, and generous amounts of butter. The dough is rolled out thinly, coated with butter, and then folded into numerous layers. If necessary, the dough is chilled to ease handling. The rolling, buttering, folding, and chilling is repeated several times to create a dough which is buttery and flaky. The danish varies from country to country, in USA various ingredients such as jam, custard or cream cheese are placed on or within sections of divided dough, which is then baked. Cardamom is often added to increase the aromatic sense of sweetness. 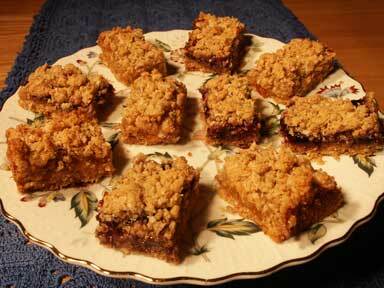 The real danish is topped by chocolate, sugar or icing, unstuffed or stuffed with either jam or custard. Shapes are numerous, including circles, figure-eights, snails, and the pretzel-like kringles. In Denmark it is called "wienerbrød" Wich means Wiener-bread, In Wien it is called "Kopenhagener Gebäck" wich means "Copenhagen bread"
Trifle is English dessert dish made from thick (or often solidified) custard, fruit, sponge cake, fruit juice or, more recently, gelatin dessert and whipped cream, usually arranged in layers with fruit and sponge on the bottom, custard and cream on top. Some trifles contain a small amount of alcohol (port, or, most commonly sweet sherry or madeira wine) - non-alcoholic versions use fruit juice instead, as the liquid is necessary to moisten the cake. Trifle containing sherry is sometimes called "Sherry Trifle" or referred to as being "High Church". One popular variant has the sponges soaked in liquid-gelatin dessert when the trifle is made, which sets when refrigerated. 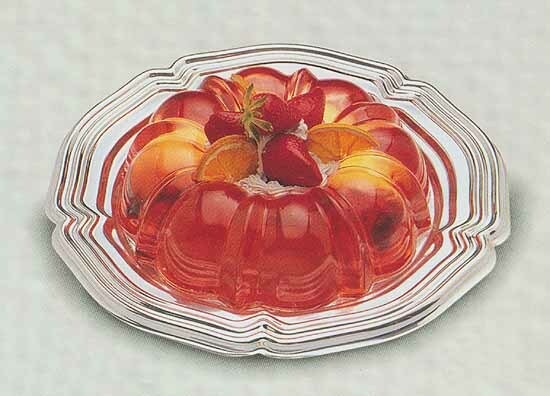 The cake and jelly bind together and produce a uniquely pleasant texture if made in the correct proportions (there should not be too much jelly added, or nucleation will not occur). 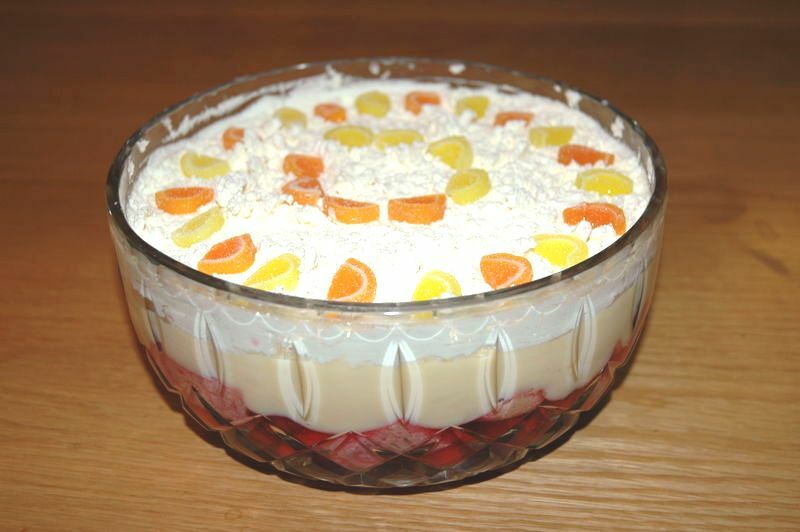 A well-made trifle is often used for decoration as well as taste, incorporating the bright, layered colours of the fruit, jelly, jam, and the contrast of the creamy yellow custard and white cream. Trifles are often served at Christmas time, sometimes as a lighter alternative to the massively dense christmas pudding. A Creole trifle (also sometimes known as a Russian cake) is a different but slightly related dessert item consisting of pieces of a variety of cakes mixed together and packed firmly, moistened with alcohol (commonly red wine or rum) and a sweet syrup or fruit juice, and chilled. The resulting cake contains an arabesque of color and flavor. 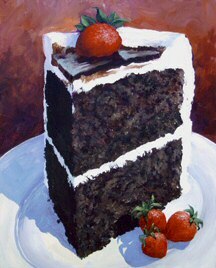 Bakeries in New Orleans have been known to produce such cakes out of their leftover or imperfect baked goods. 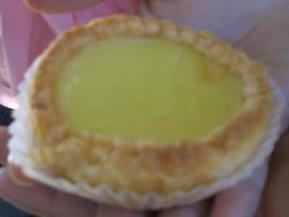 Egg tart is a pastry found in Chinese cuisine. It consists of a flaky outer crust, with a middle filled with egg custard, which is then baked. Egg tarts are typically marketed at Chinese bakeries, cha chaan tengs (tea restaurants), and some dim sum restaurants. The second character in the Chinese name is a character that closely resembles 'tart' in pronunciation (used only for its sound), while the first is Chinese for 'egg'. Today's egg tarts come in many variations due to Hongkongers' eagerness to try almost anything. These include egg white tarts, milk tarts, ginger juice-flavored egg tarts (the two aforementioned variation was a take upon traditional milk custard and egg custard, which was usually served in cha chaan teng), chocolate tarts and even "birds' nest" tarts. Frozen custard is a type of cold dessert similar to ice cream, made with eggs in addition to cream and sugar. It typically contains 10% butterfat and 1.4% egg yolk. It is approximately 20% air by volume, called overrun. Ice cream will typically have 100% overrun, which will cause the volume to double because of the air, and also give it a coarser texture. 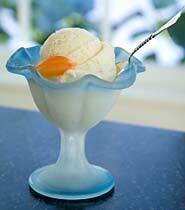 A custard will have a thick creamy texture compared to ice cream. Frozen custard must be served at 26 degrees Fahrenheit, which is warmer than the 10 degrees Fahrenheit in which ice cream is served. Frozen custard is generally prepared fresh at the place of sale, rather than stored, however, it is occasionally available in supermarkets or by mail order. Frozen custard originated in Coney Island, New York, by Archie C. Kohr. He brought the first frozen custard machine there in 1919 and sold approximately 18,000 cones during his first weekend there. During the 1933 World’s Fair, frozen custard was brought to Chicago. By the 1940s, frozen custard stands could be found throughout the East and Midwest of the United States. 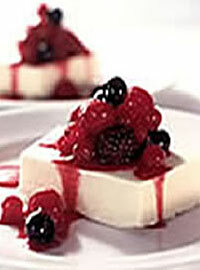 Panna cotta is an Italian phrase, literally translating to "cooked cream". Generally refers to a creamy, set Italian dessert from the Northern Italian region of Piedmont. It is not generally known exactly how or when this dessert came to be, but some theories estimate that cream (for which this region is famous) was historically eaten plain or sweetened with fruit. After years this treat evolved into what is now a gelatin-thickened custard, flavored with vanilla, fruit, or spices and served chilled. Allow the gelatin to dissolve in 1 Tbl of the cream for about 5 minutes. Combine the remaining ingredients in a medium saucepan over medium heat, stir occasionally until the sugar dissolves and tiny bubbles appear around the edge of your pan, remove from heat and add the gelatin, stir until it is thoroughly incorporated. Pour the cream mixture into small ramekins (baking dishes) and allow to set in the refrigerator for at least 4 hours, up to overnight. Serve with fresh fruit, balsamic vinegar, port, or a sweet sauce. Pumpkin pie is a traditional American and Canadian dessert usually made in the late fall and early winter, especially for Halloween, Thanksgiving, and Christmas. The pie consists of a squash-based custard, ranging in color from orange to brown, baked in a single pie shell, rarely with a top crust. Contrary to popular belief, traditional jack-o'-lantern-type pumpkins make poor pies. The pie is generally flavored with nutmeg, cinnamon, cloves and ginger and is traditionally served with whipped cream. Though some cooks make this pie from scratch, it is more common to buy canned pumpkin pie filling and follow the directions on the back of the can. 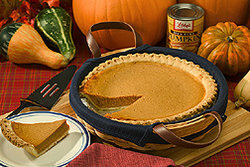 Pumpkin pie is a seasonal product available in bakeries and grocery stores. Vanilla slice is a type of cake. It consists of a thick custard sauce, which is traditionally flavoured with vanilla, and which is sandwiched between flakey puff pastry or filo pastry and iced with either vanilla or raspberry glaze. It is commonly sold in milk bars and cake shops in Australia and is often referred to as a 'Snot Block' due to the consistency of the custard. They are also popular in the north of England. It is probably a version of the 'Napoleon' which may have originated in France or Italy, though the filling is not always custard, and can be savoury (such as spinach and cheese). Zabaglione is an Italian dessert made with egg yolks, sugar, a sweet liquor (usually Marsala wine), and sometimes cream or whole eggs. It is a very light custard, which has been whipped to incorporate a large amount of air. Zabaglione is traditionally served with fresh figs and is sometimes also spelled sabayon, zabaione, or zabajone. It is also popular in Argentina, where it is known as sambayón. 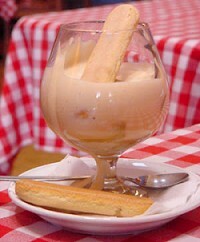 Zabaglione originated in Venice when this city ruled the Adriatic. Originally, sweet Cyprus wine was used but with the retreat of the Venetian Republic, Marsala wine began to be used instead. Another change in the recipe is the use of sugar instead of honey, the original ingredient. 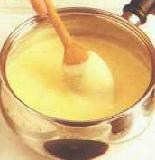 Classical zabaglione uses raw egg yolks but today many may prefer to prepare it in a bain-marie. However, it is mainly recommended to use a simple double boiler with a heat resistant bowl not reaching the water and only simmer to avoid scrambling the eggs. Beaten egg white is also widely replaced by whipped cream. Vla is the name of two Dutch food products. One is a pie, called 'vla' in the South, from whence it originates, but more commonly known as vlaai. The other is a dairy product made from fresh milk which first appeared in the 1950s. It has the viscosity of yoghurt or custard, but is sweet rather than sour. It is served cold and is available in several flavors.